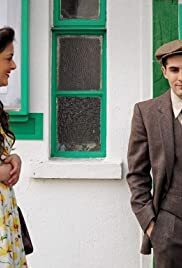 In a small town in England, 1946, Cali, an American officer falls in love with a local girl, Jean, although she catches the eye of a local young man Jim. Both men find themselves falling for the same girl, but only true love will win. In a small town in Kent, England, 1946, the world is still on edge after the destruction of World War Two and everyone is doing their part, attempting to fix the aftermath. American soldiers are still based close to Europe and a lot of these young men found themselves falling in Love with beautiful young local women. Cali, an American officer does just this, he falls in love with a local girl from the town of Gillingham. Jean, a beautiful sixteen-year-old waitress, a hardworking, lower-class, loving individual stands out from everyone in the crowd. Although Jean catches the eye of another young man Jim Yale, a middle-class young man troubled by a stutter and rebelling against his father's wishes by lowering himself to work in a garage instead of taking the well paid office job his siblings jumped at. Both men find himself falling in love with the same girl, but only true love will win.